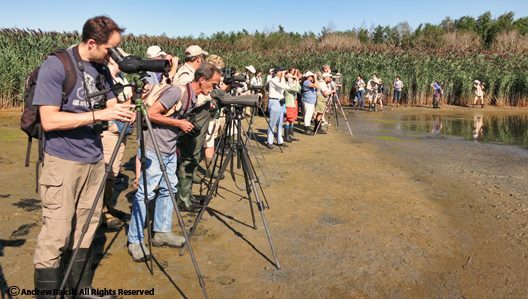 2015 Shorebird Season in Jeopardy at Jamaica Bay? Not so fast! If I were the type to throw in the towel, I would have thrown my hands in the air and walked away after taking an East Pond water level read out on June 12th. On that day, I could see the water level dropping as evidenced by the old water mark on the Phragmites but something seemed amiss. Not again was the first thought I had! 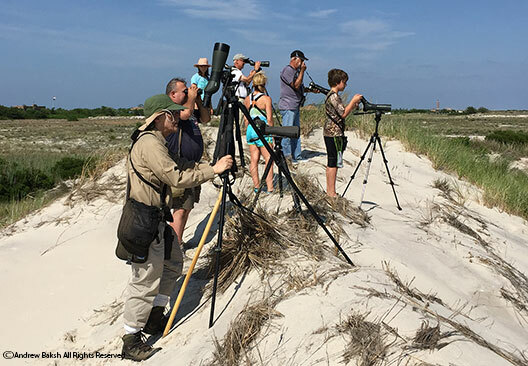 Every summer, shorebirders in the NY area especially from the 5 boroughs and Long Island, look forward to the annual pilgrimage to Jamaica Bay Wildlife Refuge in Queens. With the West Pond pretty much out of commission, due to Hurricane Sandy, the East Pond has become even more critical as a stopover site for migrating shorebirds as they rely on the fresh water habitat to feed and rest. The pond therefore has to be carefully managed in terms of water level and this is where we have encountered problems in the past for a number of reasons. On June 12th, I had this feeling of 2011 all over again. I knew the water level was too high but waited until I got home to look at my data from the past few years. After looking at the data, I was still not sure, so I decided to give it a few days and did another read out. This time I was confident once I compared the dates and water level over the past few years. We were behind on the draw down. I alerted NPS (National Park Service) management and after some fact checking, a bit of back and forth and public outcry, we finally had some movement into investigating the issue. It turned out, that the outflow pipe had some blockage and additionally, leakage and a collapsed area was discovered. NPS to their credit, is trying to salvage the season and as of today, they are in the process of implementing a short term solution by sleeving an area of corroded pipe with PVC replacement. With the blockage cleared and collapsed pipe removed the pond is draining at a healthy clip. I expect, we should see ample mudflats showing up in a week or two especially if this dry spell continues. Perhaps all of this is just in the nick of time to save the shorebird season at Jamaica Bay. Let the Water Flow! Don't you agree? Many birders go wild over wood warblers during migration and I see loads of posts about radar this or radar that and folks are usually chomping at the bit for that first wave of warblers to hit our soil. Me, I am from the Bobby Kurtz school of Calidridmanics, the ones who perk up at the mere mention of the word, "shorebirds." I just can't wait for shorebird season to get under way, in fact when the season winds down in NY, I begin the countdown to the next season. If I ever leave New York to live elsewhere, it will have to be a place where I could at least get in some shorebirding, there is no compromise on that. I was at home trying to get some work done in the midst of answering e-mails and phone calls from several birders who were concerned about the water level at the East Pond of Jamaica Bay in Queens (more on that in another post), when the e-mail came in about a Red Phalarope at West End II at Jones Beach LI, New York. There was no mention of plumage and I did not recognize the e-mail so I was unable to verify the source. The first thought that crossed my mind was about the identification. Was it right? Deciding that it did not matter if it was misidentified, I checked my timeline and decided I could put a few pending items on hold, I was in the mood for a twitch. Hell, it was a shorebird! While getting ready, a phone call came in from Robert Proniewych who I assumed was calling about the bird. I could not take the call and picked up his message until I was well on the road, then I called him. Robert, confirmed the ID was good and informed me that this bird was in breeding plumage, I was stoked! He also let me know the finder was, Bob Anderson. Good for Bob and in getting the word out quickly. This was a state bird for me and one I wanted especially since it was a shorebird. I am grateful for Robert passing on the information and his encouragement. Traffic out of Queens into Long Island that late in the morning is always a roll of the dice but today it was not too bad save for the usual bottleneck at the Hempstead exit. Why the heck is it ALWAYS like that? As I was nearing Jones Beach, the phone rang, with the sound of an Arctic Tern, I was damn, it was Shai Mitra, I had forgotten to call him and or Pat Lindsay to see if either of them were twitching. When I answered, Shai was on site looking at the bird and recommended that I make the run--in his words, "I think this is one you want to see son." In this photo, you could see that she has a damaged left leg. Letting him know that I was close, I began thinking who I could call that might have not seen the report. I called Gail Benson, Joan Quinlan and Bobby Kurtz, neither of whom answered their phones. A few minutes later, I was schlepping along the sand coming up on a group of birders. I did not even look at them, a ritual of mine for twitches. I scanned the ponds they were in front looking for that silhouetted tell tale shape I expected in the pool. It took a few seconds and I was on it. The light was not great but I stopped, put my scope up and took a few minutes to soak up a new state bird for NY. What a stunning looking bird, she was gorgeous, just the thing I needed. After studying her plumage for a bit, I continued over to the group and exchanged pleasantries. What an absolute stunning Red Phalarop--Shorebirds are the shiznit. I pretty much spent all day monitoring and studying the bird and when it flew off and disappeared for over 25 minutes, I stuck around searching and re-found it, then waited for the Fuestels and other birders to arrive. During my observation, I observed that the bird appeared to be push off more from its right side when taking flight. I suspected then that perhaps the left leg was injured but I was not sure. I mentioned my observation to Bobby Kurtz and I think also to Sam Janazzo but did not get around to looking at my photos to confirm my suspicion. When looking at my photos at home, I found my observation to be correct as you see in the flight shots (see here on Flickr for enlarged images). Even with her injured leg, this bird seemed comfortable; despite, getting flushed several times, the Red Phalarope seemed happy to return to the pools and was enjoyed by several birders including Aidan Perkins whose home hosted a Bohemian Waxwing earlier this year. It was nice to finally meet the kid and to see his mom, Keli who was such a gracious host when the Bohemian Waxwing was found on their property. 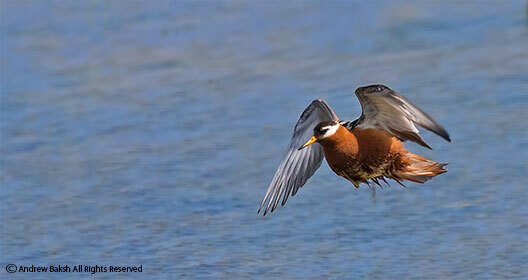 With Red Phalarope as a new state bird, I wonder what my next one will be. I hope it is another shorebird. I added to my collection of banded Piping Plovers on June 27th when I observed and photographed a banded PIPL with two chicks at West Meadow Beach on Long Island, NY. I sexed this bird as a male; it had a pink flag on the right leg with a metal band on the left leg. The color scheme, which I think is a new combination, was of a PIPL banded in the Bahamas and I have already submitted the find to the banding report site to obtain the history for this bird. This was not my first Bahamas Banded Piping Plover, I have documented a few in Queens and on Long Island. However, this one was my first for this new color scheme. I will post the information on the banding of this bird once I have a response. 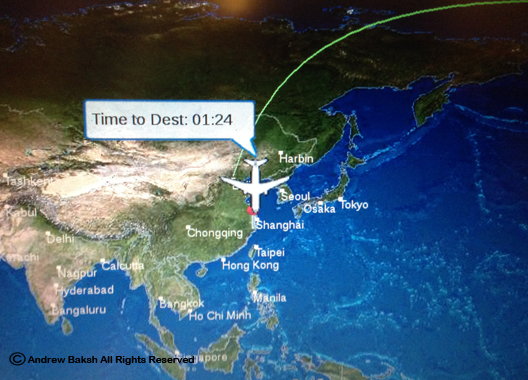 The plane landed and I was in Shanghai, getting my passport stamped and getting a smile from the Chinese Customs officer who appreciated or was perhaps amused at my use of Mandarin. I was back in China for another round of Spoon-billed Sandpiper (Calidris pygmaea) surveys courtesy of RSPB (Royal Society for the Protection of Birds). Local Shell Fisher with his tools. Those baskets with shells are sometimes carried for miles. Amid the back drop of whirring blades from the massive turbines that stretch for miles along the yellow sea in China, a whir of activity takes place on the mudflats. Fisherfolk, men and women tend to nets strung between bamboo poles that are designed to catch its prey on the rising tide. Shell fishers work the mud flats on the low tides, gathering clams and razor clams in bamboo baskets then having to carry them on their backs for miles back to the seawall where they sell their harvest to some local boss who then in turn sells to restaurants or to the market. This is back-breaking work and the payout is not that great as I learned. Additionally, construction workers can be seen either working on developing new areas for Wind Turbines or building some additional roadways. Flock of shorebirds--this is a small number. These mudflats are not just important for the local folks, they are also critical for birds! 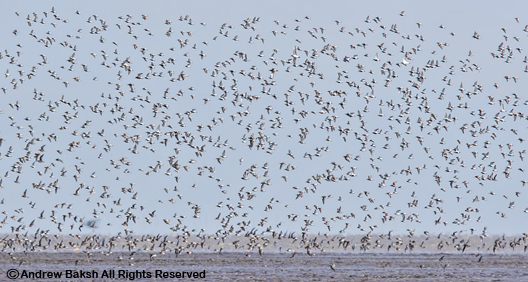 Thousands upon thousands of Shorebirds arrive during spring and fall migration. 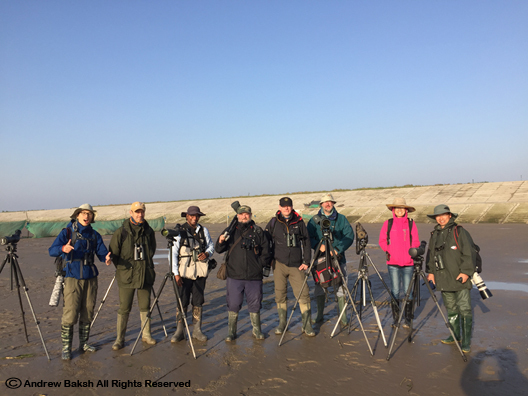 The dawn chorus of the trilling, peeping, calling of waders greets, the odd birders, photograpgers and ornithologists as they join the activity on the mudflats. The Yellow Sea bordering China and Korea, is the most important refueling stopover site for these birds as they navigate their way along the flyway covering Australasia through South-East Asia. Last year, was my first introduction to these mudflats as I worked with a group of researchers from China, the UK and Australia in documenting one of the rarest birds in the world, the Spoon-billed Sandpiper. I also banded shorebirds in Chongming Nature Preserve and worked with renowned Wildlife Biologist, David Melville in documenting the loss of habitat. 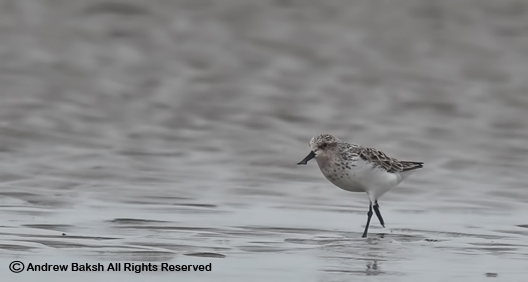 China, engaging in land reclamation has extended development out into the Yellow Sea at an alarming rate, claiming much of the mudflats used by shorebirds. This is a cause for concern and I was proud to be selected to assist David and the Chinese researchers in documenting this issue. This year, I returned only this time my assignment was focused on working with the Spoon-billed Sandpiper team--the representation was only the UK and myself from the US working alongside Chinese Ornithologists and students. 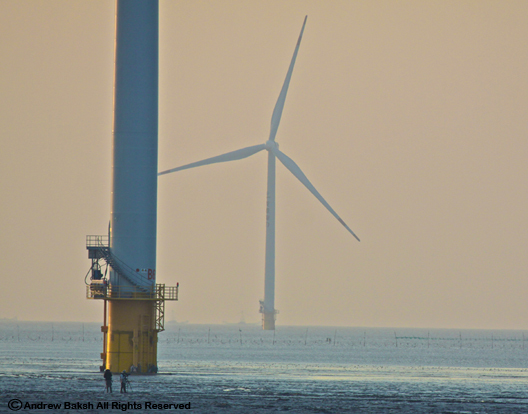 Surveying against the backdrop of massive turbines on the mudflats. 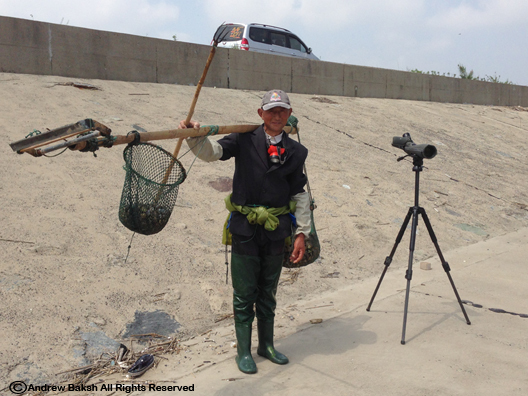 Our surveys were in the Jiangsu Province, about 2-3 hours away from Shanghai on the mudflats of several sites. Depending on the tide cycles some surveys can be very early, especially if we have to factor in driving time and wanting to be on site a few hours before start time. It is extremely hard work and we tend to spend 12 + hours on the flats walking for miles in mud that can be very tricky and even dangerous to navigate. But work we must, schlepping our way around the mudflats at designated spots about 300 meters apart once given our assigned areas by the team leader. Each field ornithologist then begins to sift through birds either during rising or lowering tides. Depending on the tide cycles, sometimes we do two rounds per day. By the end of the day, a tired team drag ourselves to dinner and then to the data review session. Some nights we are heading off to bed around midnight to grab a few winks before we start all over again sometimes around 4:00 in the morning. This blistering pace that we set, continued through the duration of those good tide cycles. Sometimes we were going at a hectic pace for 7 days straight; this is not for the uninitiated. You have to be physically and mentally fit for this stuff. Nerves can get frayed as fatigue settles in and this is where team chemistry is so important. Last year, I bonded with some of my British teammates who loved my passion for shorebirds and how I worked with the locals; I considered myself lucky to be working alongside them then and a few of them again this year. We picked up right where we left off with the bantering and on field challenges. I consider some of these guys life long mates! Spoon-billed Sandpiper with Code 3 plumage. Are there on field challenges? Yes, several. The mudflats are very tricky and in some spots outright dangerous. Cuts, especially deep ones in the flats which are not too bad to navigate on a low tide could be quite dangerous on a rising tide. One teammate got stuck this year and it was noted that emphasis on "safety" needed to be included in the playbook on navigating the flats. Lack of Spoonie sighting. This can become a heavy burden for the teammate who fails to record a Spoon-billed Sandpiper when all other team members have documented either one or multiple. Sure, one could make up a sighting but we are all honorable Ornithologists at the top of our game doing scientific research--no stringing with this bunch. Code 6 Spoon-billed Sandpiper with Sanderlings. Our documentation of Spoon-billed Sandpipers include observing behavior, noting the plumage score (there is a plumage chart for this 1-7, with 7 being almost breeding plumage), getting a GPS location, time and tide cycle. If you found a flagged bird, it was critical to note the color, which leg it was on and a read out of the code if in-scripted. Photos and videos if possible of flagged birds are also quite important. 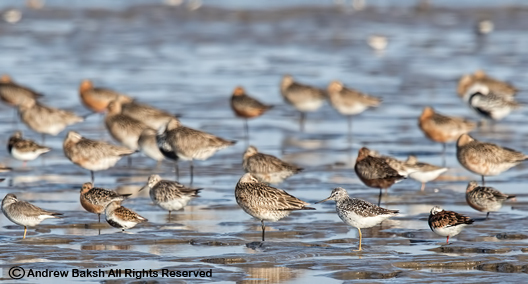 In addition to looking for Spoonies, we also are required to note shorebirds flock size and the breakdown. Documenting other flagged birds are also of importance. Even when you are not finding Spoon-billed Sandpipers, there is much to enjoy on the flats in seeing other rare or endangered birds, such as Saunders Gull or Nordmann's Greenshank or Black-faced Spoonbill. A few of us were also keying in on the type of habitat (the mudflat makeup) Spoonies tend to be found in while feeding. All of this requires discipline, focus and skills. No one leaves their station to chase down someone else's Spoon-billed Sandpiper sighting...even if you were batting zero to that point. This is serious business, requiring team work, it is not an individual quest and no one has much time to think about their own listing. This is work readers, hard work -- for me when you love what you do, it becomes easy and I absolutely loved every second of my time on the flats, even when I was not finding Spoonies. Nordmann's Greenshank with roosting shorebirds. Can you identify all the species? The survey does not end on the flats. During high tide, the task would turn to locating roosting flocks and to then documenting the make up of the roosting flocks, while sifting through them for Spoon-billed Sandpipers. Sometimes this involves a lot of walking depending how far you found a roosting flock. Our driver Mr. Tang, is invaluable in this process as he has to be aware of who might need a ride to a far off roosting site. More often than not, the team leader, is the one who gets to keep the driver. Whoever keeps the driver must not be selfish in that it becomes all too important if the weather becomes sticky as getting caught in the rain without proper gear can be problematic for our optics. The driver may be required to rescue someone who might be caught in a downpour with nowhere to shelter. Sometimes, looking for roosting flocks takes us to fish ponds where we have to walk along mud banks looking through every fish pond in the hopes of finding roosting birds. Tough to score - I settled on advanced Code 2 and a Code 3 Spoon-billed Sandpipers. Working roosting flocks requires quick work. There is a time factor in all of this, meaning that we have to move quickly before the tide turns. These shorebirds are quite attuned to the tide cycles. I have often watched how within minutes of the tide turning, a scout group would head out from their roosting spot over the seawall and circle around looking for open mudflats. They know the areas that offer higher ground and the long legged waders like Bar-tailed Godwits (Limosa lapponica) are some of the first to scout. Eventually joined by other long legged waders and finally the peeps show up. From my experience with the various tide cycles that I have birded in New York, I find that the tides in China move at a more rapid clip on both rising and lowering. You might be wondering how we did this time around. Well, let me throw out some numbers for you. 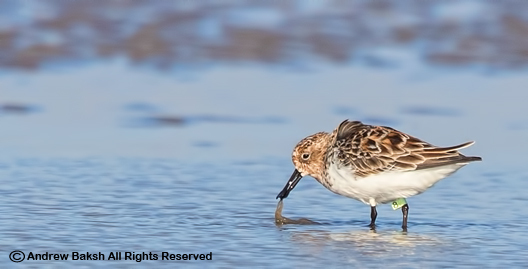 At a minimum, the team recorded 62 individual Spoon-billed Sandpipers with a total of 251 different sightings. Out of that number, my personal tally was 101 Spoon-billed Sandpipers. In total we documented 13 flagged birds of which I found 7. I would say we had a pretty successful survey! Advanced Code 6 Spoon-billed Sandpiper which is also a flagged bird. Hours became days and days became weeks, all too quickly the survey was wrapping up. I was going to miss my teammates and all the new friends I made on this survey especially, Zhang Jun, Jiayu Xu and her mom, Professor Chang and his two students, Xiaohui Ge and Wei Liu! I love China, the people, the culture, the food and most of all the birds. It was time to move onto other business in China. The survey was coming to an end but I was going to do some other birding in China with my mates Adam, James and John. This was going to be an important part of my trip to China as I am in the process of designing my own tours to China as part of Calidrid Tours. If you are interested in adding Spoon-billed Sandpiper to your shorebird list, contact me at birdingdude@gmail.com, I am already planning on returning this fall or next spring either doing surveys or leading my own tours or both. Check back for my post on my non survey birding adventures in China. There are lots of good birds to report!